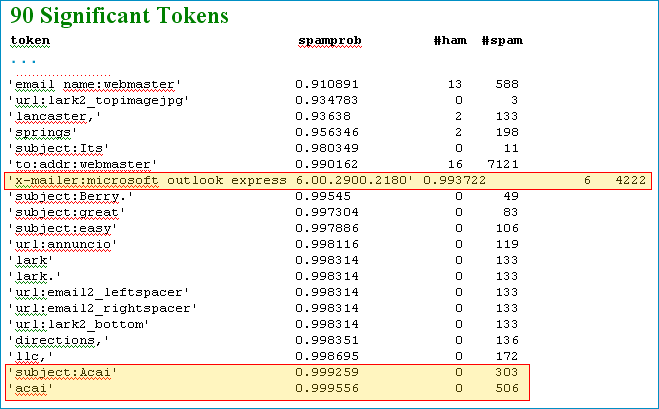 I've been using the terrific anti-spam plug-in Spambayes for years now in Outlook. It takes a very short time to install and configure. What I like is how I tell it how to "train" itself, pointing it to my good email folders - the "ham" - and keeping my "spam" in a separate folder. After the initial training, I just have to help it make some decisions about junk email suspects, by making the final "ham" versus "spam" decision. In the process, my Spambayes gets even smarter. Only today did I try the option "Show spam clues for the current message"
The results really show me what Spambayes is using behind the scenes to score my messages, based on my personal "ham" and "spam" folders. Not so surprisingly, not one legitimate email I've received has included the term "Acai", and 506 junk email messages have included it. A little surprising to me, 4222 junk emails have been sent using Microsoft Outlook Express 6.00.2900.2180 (or at least identifying themselves as using that software), but only 6 legitimate emails I've received come from that software.